I always carry a nice roomy tote to the beach as it’s perfect for throwing everyone’s things in it. There are so many gorgeous beach bags out now whether it’s made of canvas or straw so shop around and find one that perfectly suits your lifestyle. The bigger the better! I like a nice, big fluffy beach towel. I always need to be able to spread out my things and I like being able to lay down without having my feet hanging off into the sand so space is a necessity. I usually opt for a pair that has larger lenses so I can be guaranteed extra coverage throughout the day. I’m quite militant about wearing sunglasses to protect my eyes in summer so I always invest in the best quality I can. Believe it or not I bring three different kinds! One for the body, one specifically for the face and a kids’ sunscreen for the girls. I like a multitasking lip gloss with a built in SPF. The sun can be quite dehydrating so I like one that I can use as a moisturiser but can protect me at the same time. I am all about protecting my face from the sun’s rays so I definitely always pack a wide brimmed hat in my beach tote. A beautiful straw hat is my go-to. My swimsuits tend to be in plain block colours a lot of the time as I’m not really into wearing too many prints. I go for navy as it’s classic but I’ve also got swimmers in black, khaki and cream. I’m a watch girl so I always wear a watch to the beach. The only mandatory is that it be waterproof. There are so many great, inexpensive watches out there now so I’ve found some great options that will survive a day in the sun. I like to take a pair of sandals that I can slip on and off quite easily. I hate having to deal with multiple straps when I know I’ll have to be in and out of them the whole day. I always bring a cover up of some sort so I can pop it on really quickly if I need to grab lunch or a drink for the girls. I like anything lightweight (linen is good! ), airy and really uncomplicated – I just need to be able to take it on and off quite easily. What are some of your beach essentials? This is the number one place you will find me in summer as it’s so close to where I live. It’s my favourite beach as it’s ideal for kids as there are no waves. I take the girls here all the time and we love spending a day out there as a family. 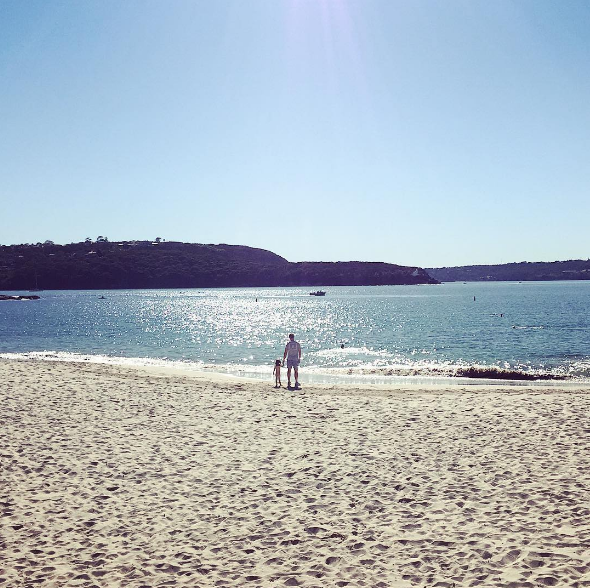 I love going out for breakfast and this spot is located in Balmoral Beach and is right next to the water. The food and coffee is amazing. Be warned though: lunchtimes are ridiculously busy, especially if the weather is great. The menu is full of great options that I always find it hard to choose what to order. 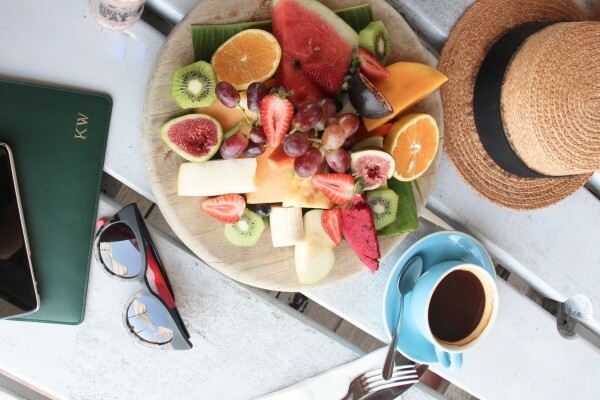 We’ll sometimes go to Bathers’ for breakfast or to grab an early family dinner. It’s got great views and has a relaxed vibe that’s just perfect for summer. I am a fan of the original Bistro Moncur in Sydney’s Woollahra so I was pleased when they opened up a second location in Mosman. The menu is French meets modern Australian so there’s everything from sirloin with buttery Café de Paris sauce to pan friend barramundi fillet. Amazing. I love Italian food so can’t go past this restaurant in Potts Point. It’s cosy, the food is super hearty and is perfect when I just want to experience a touch of Italy. Also located in Potts Point, Apollo serves up modern Greek food that’s unbelievably delicious. The main dining room is light and airy is one of my fave spots for a long, relaxing lunch. When the weather is warm Bondi Icebergs is a definitely must. The view can’t be beat and the vibe perfectly encapsulates the special atmosphere during an Aussie summer. What are some of your favourite summer haunts? A summer hat is a must as I’m always at the beach and I particularly love the pink ribbon and writing on this. It’s a simple and sleek design but the gold hue and the chain detail make this bag special. The beautiful flowers are the striking element of this shoe and add a feminine touch to any ensemble. I have a soft spot for sunglasses and this pair is definitely going to have to be added to my collection. I need a new pair of sleek yet comfy sandals for summer and this pair by Prada certainly does the job. Slides aren’t going away anytime soon and this dressy pair will work with so many outfits in my wardrobe. I like to get a new bikini at the start of summer and always opt for neutral colours with zero prints or patterns. I love the scallop detailing and one shoulder style of this bikini, plus you can never go wrong with classic white. These are a great take on traditional hoop earrings but with its slightly sculptural look it has a unique point of difference. I can often be found in skirts or dresses during the warmer months and this piece, with its gorgeous pattern and colour will certainly be on high rotation. I’m a big fan of the midi length so generally gravitate towards those pieces which is one of the reasons I love this dress. However the gorgeous ruffles and vibrant hue is what really has me wanting to snap it up. What’s on your summer shopping wish list? Easy-to-wear dresses are a staple in my summer wardrobe, especially when I’m packing for a holiday. I always try to go for pieces that won’t crease in my suitcase. Knits are especially great, as they don’t require ironing if you fold them carefully. I recently wore this Rebecca Vallance dress on my holiday in Greece. Anything with a blue and white combination always gives off nautical vibes. I was instantly drawn to the ruffles as they add a feminine feel. 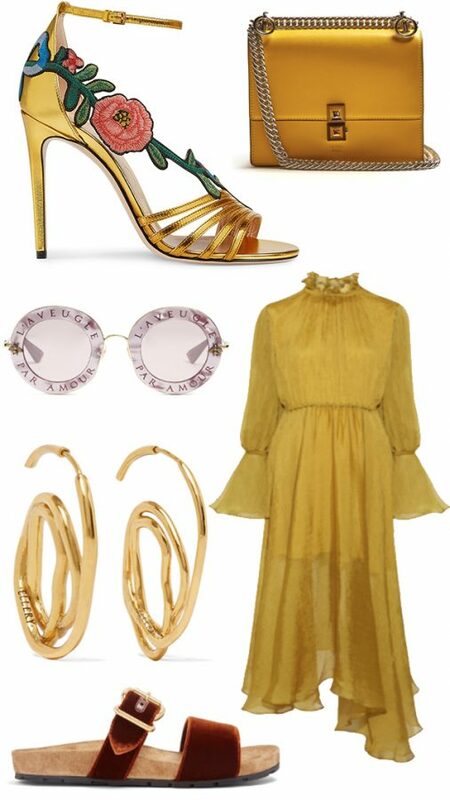 For instant style points, I teamed the dress with my Rebecca De Ravenel earrings. Statement earrings have become my go-to accessory for adding a bit of colour and fun to my ensembles these days. I recently went on a family holiday to Fiji which was the perfect getaway – there was plenty of beachtime and relaxation involved which is just what I needed after a busy year. My holiday wardrobe when I’m heading to a tropical destination usually involves lots of lightweight dresses and cover ups so this Studio.W striped shirt really fit the bill. 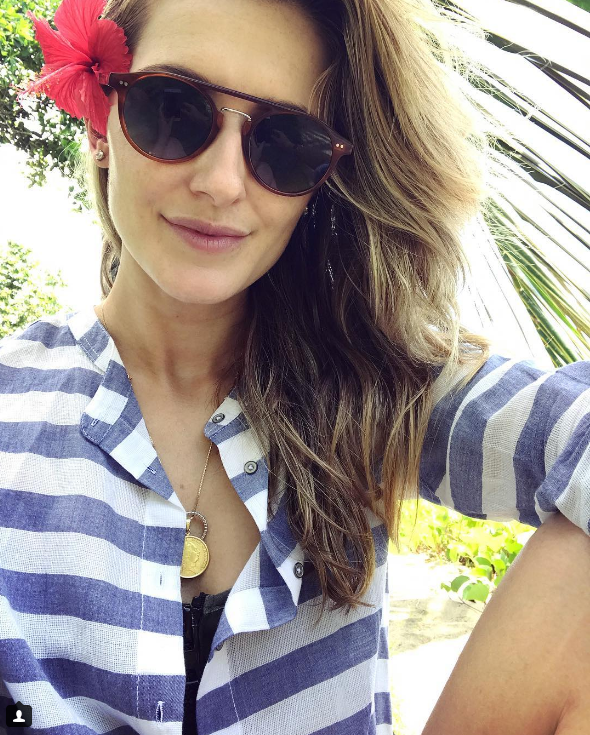 As it was a slightly longer cut I decided to use the shirt as a dress and it was perfect as it was easy to throw on over my swimmers and I was able to go from the beach to lunch with minimal fuss. I’m always a big fan of stripes for summer and this shirt in its blue and white colour-way had a great nautical feel and was the perfect relaxed look for a day out in the sun. I just threw on a boater and some sunnies and I was set. When I’m on holiday I’m definitely all about an outfit that’s simple and easy. With the weather warming up it’s time to get your sandal game on. There are so many fun options this season from strappy, to pom pom embellishments and metallic details that I warn you, you’ll find it hard to narrow it down to just one. A pair in a black or tan will always work back with pretty much everything in your wardrobe but this season update your look with a pair of slides. They’ll be everywhere come high summer. Now, just don’t forget to get a pedicure in a beautiful, punchy shade. My date with Samantha Jade at Sokyo, The Star. Samantha Jade was the first female to win the Australian series of The X Factor Australia in 2012. She subsequently signed with Sony Music and released her winner’s single “What You’ve Done to Me” which reached number one on the ARIA Singles Charts. Jade has had a series of hits since and she released her second studio album, Nine, in November last year. Jade also starred as Kylie Minogue in the mini-series, INXS: Never Tear Us Apart in 2014 and this year, Jade has joined the cast of the long-running soap opera Home and Away. I chatted to the 28-year-old about her career, her plans to make it in the UK and how the death of her mother, Jacqueline Gibbs, impacted her music. What are you up to, at the moment? I am preparing for a bit of a big year. [My] deluxe record will be out this year… [I’m] a guest role in Home and Away, which is pretty exciting… It was so fun to film — it was so different than the Kylie, INXS role. It’s so different from the real me so it was a really creative moment. I love it… A lot of people say acting and music are similar. It’s not! It’s actually really different. Music obviously, is self-expression because if you’re a writer and you’re writing about your experiences. With acting, you’re playing a character, you’re playing someone who is not you, who shouldn’t think like you, who hasn’t been through what you’ve been through — you’ve got to create a whole world for them. It’s really different and I really enjoy that side of it because it just is so creative. How do you measure the success of an album? I think that that’s something that comes with age, realising what success really is and I think that a few years ago if you would have asked me that I would have said, “Oh Top 10. It has to be Top 5 or it’s not good enough.” For me now, after everything I went through last two years with my mum [passing away]… success is such a different thing to me now and happiness has become my number one and just my whole idea of life has completely changed. So for me, getting an album out, was a really big deal and for people to actually listen to it and actually getting those messages that I wanted to write about across — that’s success to me. It has really changed for me, I just am happy it’s out and that my fans are happy with it … There’s a song called Nine on there about my mum and a lot of people have written and said, “That’s gotten me through… I lost my Grandfather. I lost my uncle or I lost my Dad” it’s such a positive spin on such a sad moment. It has really helped me and that’s success. Your new album draws inspiration from dark moments in your life, including the death of your mother; in what way did the passing of your mother impact your music? Yes [it impacted my album hugely] I took a lot of 2014 off because she got sick that January. Australia Day we found out she had cancer, which was the hardest day… I basically relocated back to Perth and I still had to work but I just would fly over and fly straight back. It was a full six months and it took a lot out of us. So once everything happened and she passed, we went on a holiday. I came back and started to rewrite the album because I felt like everything I had written didn’t make sense anymore for me. How did you manage to get an album out? What do you do in your time off, when you’re not working? I love to shop, I love to go to the movies, and I love to go to the beach. And I’m the ambassador for “Star Summer Hits” at The Star Sydney. It’s really exciting because I’m a Perth girl and Sunday sessions are huge thing in Perth and it’s really hard to find that out here in Sydney. So, Thursday through to Sunday on the Sky Terrace they’ve got a beautiful bar in the middle and there’s this really cool little area with grass and it’s just a nice way to let your hair down through summer and a very nice little Sunday session with champagne, brunch. It’s just lovely. I would love to go to the U.K. That’s a really big thing for me. I would love to go there and just feel it out [career wise] and see how it would go. So, that’s my goal this year. And the deluxe record and maybe a tour and just to stay in music. What is the biggest impact winning X-Factor has had on your life? My job is now music. I get to wake up every day and do what I love. That’s incredible to say, not many people can do that and say that. But I think the ability to inspire people is a really incredible feeling that I’ve only realised how powerful that is in the last year, because of my album and because of what I went through and when I went through what I went through with my mum and there’s so many people that go through that, and having a little bit of a profile — you are lucky because you can inspire people, I’m really like to have the ability to do that. I hopefully am married by then, and having a child because having a baby and being married is as much of a dream for me as music is… So, I’d love that and I’d love to still be in music. I always say Ed Sheeran because I think he is one of the best songwriters of our generation… There’s no facade with him. WE WENT TO Sokyo, The Star, Pyrmont. WE ATE a fruit platter and a selection of pastries. WE DRANK coffee and juice. I love bringing a sarong on holiday because it’s so versatile. It can be used as a sarong or a scarf or a beach cover up. A sarong in a monochrome is even better because it’s really easy to wear it with multiple outfits. Sun protection is always really important to me which is why I always have a wide brimmed hat whenever I’m heading out to the beach. This summer 70s style round frames are going to be huge. It’s an easy way to update your look. I love the simplicity of black slides. This particular pair will work equally as well with a sun dress as they will with a skirt and top or a pair of denim shorts and a tee. A girl can never have too many bikinis, right? This particular pair is ever so slightly more glamorous than your average bikini which I love. I love that everything’s crisp white this season and I’m especially loving that white on white look. It’s really fresh for summer plus it suits all occasions from weekends to nights out. I think it’s a really beautiful look. I have a soft spot for pastels. I think gelato and sorbet colours are really complementary on so many different people and skin types and I think that it’s a very pretty look for summer. I love that sporte luxe look. I’m all about laser cuts, and neoprene. It’s a bit edgy and a bit sporty for summer. It’s a nice contrast to the more feminine look of the pastels and all white trend. What sumer trends are you loving?